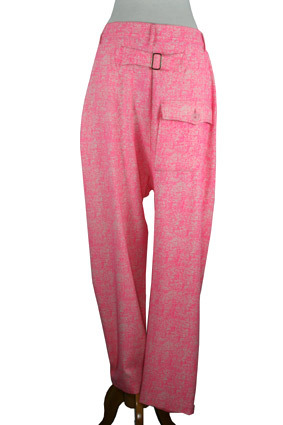 Vivienne Westwood silk trousers (Brigadier Trousers) in mottled pink and off-white. Zip fly with button fastening. Single doubled pleat. Belt loops. 2 side pockets and single rear pocket with flap and button fastening. Half-belt at rear with metal buckle. Quite low crotch. Beautiful trousers that match the jacket in the same fabric to make an awesome suit.